Product #20896 | SKU TBC406 | 0.0 (no ratings yet) Thanks for your rating! 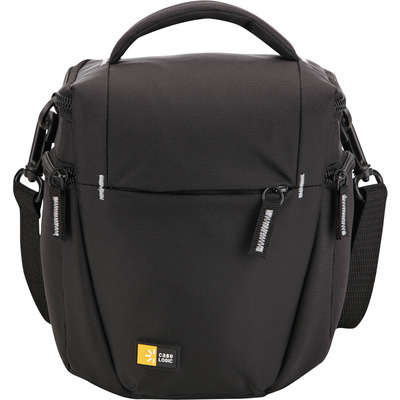 The black TBC-406 DSLR Camera Holster from Case Logic combines style and functionality in a well-made, cost-effective bag. The holster is designed to hold your DSLR with lens attached in shooting position. All you need to do is unzip the bag, withdraw your camera, get the shot, and replace the camera, lens facing down. This kind of "run-and-gun" style eliminates the need to take out a camera body, attach a lens, shoot and then disassemble them when finished. The top of the holster opens away from your body providing both faster access and more security since when the bag is open, only you will be able to see what's inside. When you're shooting in a crowd, this extra level of security is valuable. The holster is made from a Dobby, woven nylon and thickly padded to protect the contents from the various bumps and abrasions that sometimes occur during a day in the field. Inside, there's a small zippered pocket for an extra SD card. Outside, there's a simple slip-in pocket for your lens cap that we all know seems to disappear faster than anything else. Carry the holster by its adjustable, removable shoulder strap or its top grab handle. For even more convenience, there's a rear belt loop that can be also be attached to your backpack or other bag. The zippers have pull tabs that make opening and closing the holster easier when you're wearing gloves. At only 7 oz, this lightweight bag is for anyone who wants a minimalist approach to carrying a single camera/lens combination and who enjoys or needs the ability to shoot quickly. The holster is backed by Case Logic's 25-year warranty.